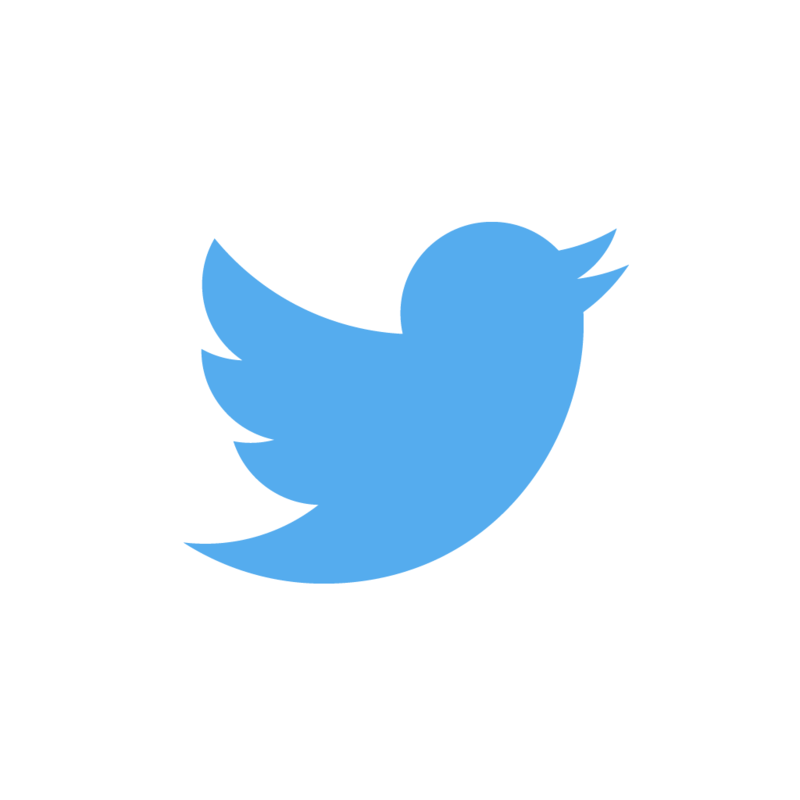 High-profile Twitter and other social media gaffes should not burden athletes forever. Social media is forever, but the mistakes we make on them are not. This is a lesson slowly but surely playing out in the sports world, as social media platforms — and the athletes using them — mature. In the short history of Twitter and Facebook, athletes have found ways to make massive mistakes that capture headlines and cause headaches. Whether insensitive opinions, politically-motivated comments or just plain dumb decisions, social media gaffes are easy targets. Traditional news media lampoon them. Fans fuel their virality. And declarations abound that so-and-so athlete is “done with Twitter” or “will never recover” from just a few characters sent in haste. But I believe social media is much more pliable, and sports fans are forgiving. This is especially true when athletes — whether stated or unspoken — learn the error of their ways and use social media more effectively and creatively. My proof? Three examples of athletes who have recovered rather well from high-profile social media mistakes. At the time a third-string quarterback at Ohio State University, many wrote off Cardale Jones because of his October 2012 tweet, which lamented the student part of being a student-athlete. Mr. Jones clearly hadn’t grasped the realities and rigors of college life. This infamous tweet was not the end of the story for Cardale Jones. Jones quickly deleted the tweet and locked his account. BuzzFeed declared he was “probably not going to be tweeting anymore.” Ohio State even suspended Jones for the tweet — something still rare in college athletics. But a funny thing happened in the two-plus years since that fateful tweet: Cardale Jones recovered. He cleaned up and eventually re-opened his account, and began tweeting again. Armed with the lessons he learned, Jones was able to move on and use social media as an instrument to build his personal brand. And that’s a good thing, because Jones was thrust into the spotlight during Ohio State’s championship run in college football during the 2014-15 season. Jones’ Twitter game is at championship level, too, offering a glimpse into his world — which is the social media sweet spot for athletes and their fans. Are some waiting for Jones to make another mistake? You bet. 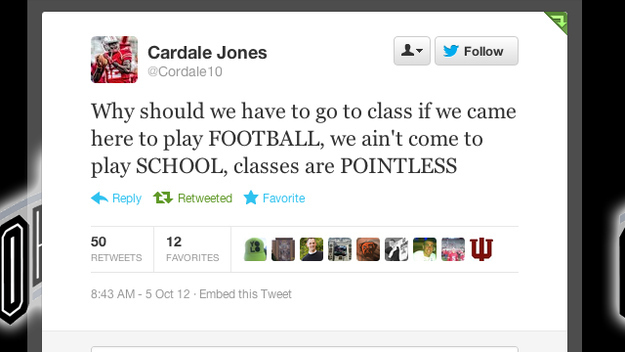 But the sins of the past are now in the past, and today Cardale Jones gets press for being awesome on Twitter. Rashard Mendenhall had a Super Bowl ring, a big contract and a bright NFL future. He also had opinions and took to Twitter to share them following the 2011 death of Osama bin Laden. Mr. Mendenhall tweeted controversial and somewhat strange reactions to the news many Americans celebrated. As noted in my May 2011 coverage, Mendenhall’s error was less about having a contrary opinion and more about using Twitter to share such complex ideas. He followed that up with a longer-formed blog post, entitled Clarification. The damage was done, though, and the Pittsburgh Steelers’ star running back quickly lost an endorsement. Traditional media piled on. Mr. Mendenhall’s tweets were chiseled mistakes on a rock-solid indictment of his character. Two years later, he quit football altogether at age 26. Today, that story would stand alone because of its implications on the league. Instead, it was paired with mention of inflammatory tweets (which, to his credit, Mr. Mendenhall has never deleted). Leaving the NFL was not the end of Rashard Mendenhall’s story, though. He used the announcement to showcase his writing talents through an exclusive Huffington Post piece entitled Why I retired at 26. The op-ed has been shared some 50,000 times since its March 2014 posting. It helped launch Mendenhall’s new career, which includes a writing credit in the HBO television series Ballers, debuting in June. In a recent USA Today interview, Mendenhall affirmed his decision to leave behind the NFL and pursue his passion for words. The article included no reference to those May 2011 tweets that many had used to characterize him. The etched errors of the past aren’t even a footnote on Rashard Mendenhall’s career, who uses his new talents to reach sports fans in different ways, including his most recent and rather thoughtful HuffPo piece on what the NFL could look like in 10 years. While sports draw many to social media, politics often illicit the opposite reaction. The nuanced ideas that accompany political issues are deeply personal and difficult to express in 140 characters. The constant partisan bickering is a social media turnoff. It’s why pro golfer and commentator Paul Azinger became a lightning rod for controversy. Early on, he used Twitter to share his sports passion, knowledge and experience along with biting, bitter political commentary. I challenged Mr. Azinger’s approach on Twitter and in a February 2011 post, when he chose to weigh in on political events in my Wisconsin backyard from his in Florida. It was less about partisanship and more about the risk Azinger faced by alienating fans, who had presumably followed him for his golf wisdom. Later that year, his employer — ESPN — publicly rebuked Azinger for his political comments on Twitter. The company even updated its social media policy. Instead of quitting Twitter, Zinger pivoted. Topics soon turned to golf, his new app and other fan-friendly fodder. His tweets complemented ongoing golf commentary, and his broadcast career flourished. I know Paul Azinger still has political opinions, but they do not dominate his Twitter feed. What you see instead is honest and open commentary about current golf trends, tournaments and players. Time has weathered his social media mistakes, smoothed over by more than 131,000 interested followers and valuable, engaging content. Don’t get me wrong, these three high-profile athletes can still be somewhat controversial, and they have plenty of detractors. But they’ve learned social media mistakes are truly not forever. And that’s a lesson for everyone. One bad tweet should not ruin an athlete’s career — or anyone’s for that matter. It does not have to be a scar that never heals. Social media mistakes are just like any other missteps in life. We can all learn from them and become better people in the process. That was very interesting! Thank you.